Enable prompt for email address. Note responses are anonymous – but responses will be captured alongside the agent’s name. 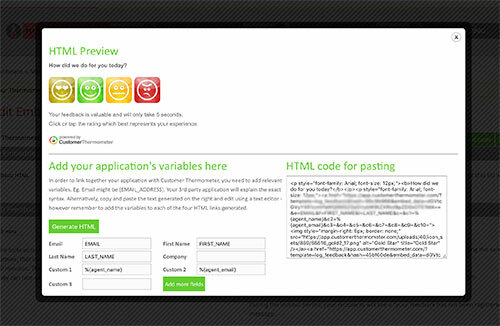 In the future – Groove are hoping to expose more fields – which will mean identifiable feedback. Inside Groove, go to “Settings” >”Ticketing” > “Mailboxes” and add a signature per mailbox. 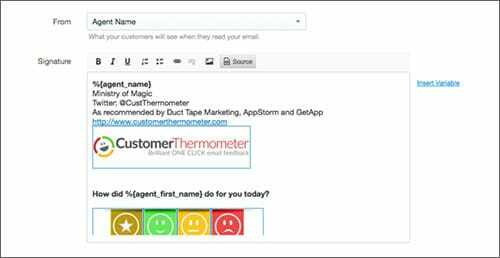 Your Thermometer will now be embedded into the signature of emails sent by agents. That’s it, you’re ready to go. Responses and feedback will be registered, alongside your agent data from Groove.